You set up your test to require proctoring. You can also add an exception to an unproctored test to require proctoring for a specific student. Academic Admins can also be required by the registrar to be proctored for all tests. When the student takes the test, Populi asks the proctor for contact information, including a mobile phone number. Populi sends the proctor a check-in code via SMS. After the proctor enters it, the student can take the test. After the student submits the test, Populi sends the proctor a check-out code via SMS. The proctor must enter the code and check to verify that he did not observe any cheating. 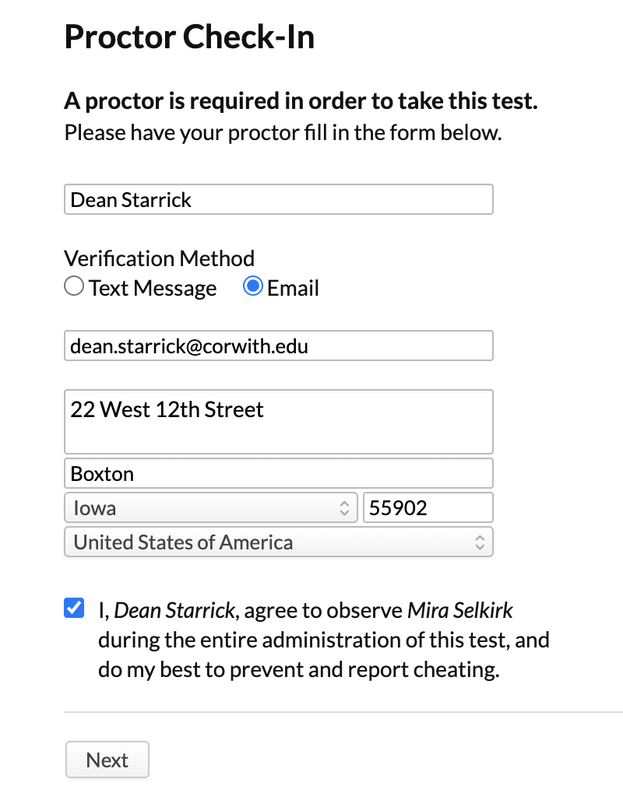 If the proctor doesn't check out, the test is flagged for your review in the test history. Proctored tests show you the contact info for the proctor and links it, if possible, to people already entered in Populi. This helps you contact the proctor to verify his identity. When you're adding the new test assignment, check the box in the Add Assignment dialog next to Require proctoring. In the Information panel in the right column, click the Proctored setting name. To require proctoring for an individual student on an otherwise unproctored test, add a proctoring exception for that student.